There are four Gorilla Trekking Regions of Bwindi Impenetrable National Park. These regions include Buhoma, Ruhija, Nkuringo and Rushaga sector of Bwindi. Uganda with almost half the number of the world’s mountain gorillas offers the best opportunities of seeing the endangered primates in the wilderness. In case you planning to do gorilla trekking safaris in Uganda, you will trek the rare apes in any of the regions and allocated to any of the gorilla families found in Bwindi Forest. If you choose the best tour company to offer quality services, you will realise at the end of your trip that Uganda has the best gorilla tours in the region. 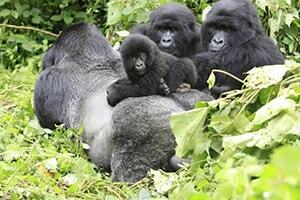 You can enjoy gorilla trekking in Bwindi by starting the trips from Kampala, Entebbe or Kigali in Rwanda. When you choose to do gorilla trekking in Uganda from Kigali, you will visit gorillas of Rushaga, Ruhija and Nkuringo. These are the easily accessible sectors of the park from Rwanda. Buhoma sector is good when you are only doning a 3 days gorilla safari from Kampala or Entebbe by road or flying. Also a any trip package that involves activties in Queen Elizabeth National Park is ideal to add in Buhoma gorilla trekking. 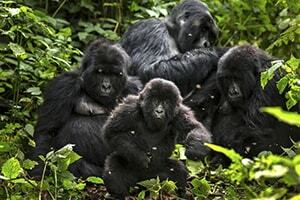 This is found in the northern section of Bwindi Impenetrable National Park with gorilla groups that include Rushegura family, Habinyanja group and Mubare gorilla family. Nkuringo gorilla section is found in the south of Bwindi forest. Nkuringo sector is among the most visited with gorilla families that include Bikingi, Nkuringo and Bushaho gorilla family. Ruhija is found in the Eastern side of Bwindi Forest. It has three gorilla groups which are; Bitukura gorilla group, Oruzogo Gorilla family & Kyaguriro group, mainly for research. Found in the southern side of the park, Rushaga has the biggest number of gorilla families including Mishaya, Nshongi, Kahungye group, Busingye and Bweza gorilla family. To ease gorilla tracking in Bwindi, the Uganda Wildlife Authority divided the park into above regions which are distanced from each other. 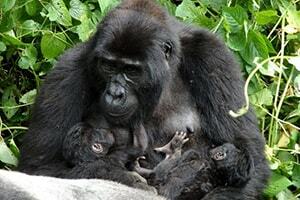 Each region has gorilla families under it and there is a given number for every family cluster. 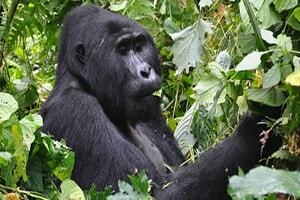 The park management assigns 8 visitors to track each gorilla group in Bwindi. The number of visitors is limited to 8 to create convenience on the side of visitors and create comfort to the endangered primates. There are several accommodation/lodge facilities in Bwindi around every section where travellers on gorilla safaris stay for trekking adventures. The gorilla trekking Rules and regulations plus guidelines that govern the wild exercise apply similarly is all the said regions. Geographically, Bwindi National Park is spread a wider area in the south-west of the country. The regions with their nearby lodge facilities help in bringing the tracking services closer to the visitors. Tourists don’t have to drive for long distances to arrive at their allocated gorilla groups.